I was just seven years old and sick as a dog, the stifling summer heat and humidity, I had the whopping cough and I had it real bad. It's just a bad cold, the boy will soon be over it. Coughing at night till I vomited blood, couldn't eat or drink, just the coughing and the sickness. A rushed trip to the doctors, hushed conversations between the grown ups, no smiles, needs penicillin. Lying in my sick bed staring at reflections on the ceiling, on the radio they play "Summer Breeze" by the Isley Brothers on a continual loop it seems... "Summer breeze makes me feel fine, blowing through the jasmine in my mind". I awake, it is dark, vague muffled night sounds but inside my head the all pervading sound is a very high pitched whistle like the sound the television makes when there are no more pictures late at night and a tiny white dot remains in the centre of the screen. Tinitus, I still have it to this day, I don't normally even hear it unless I am highly stressed or it is exceptionally quiet, a bit of an affliction for someone who would earn money as a sound engineer. Sound engineering is a much an art as a science, different engineers can work on the same mix, achieve different results and yet both can still sound good. As you tweak and tune the parameters you often sweep up and down, back and forth till you find the "sweet spot" where it all works best. This morning I swapped over the Alpine SkiBikes foot pegs between the "old" black and "new" silver frame. 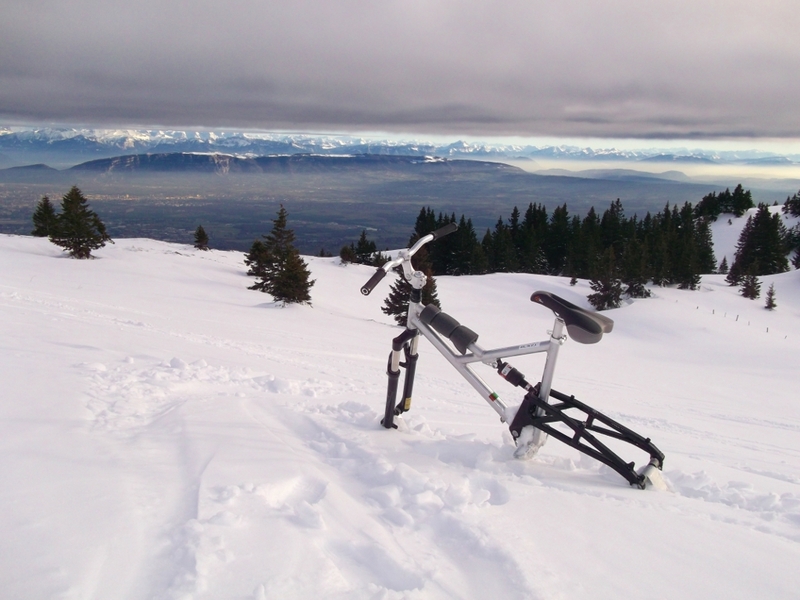 I then took the silver frame up the local test hill nearby at Le Crozet and went for a few hours ride. 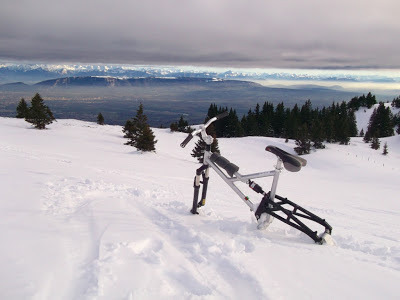 What a difference, yesterday I was afraid to push the skibike for fear of loosing control. But today, with the ability to grip the frame with my feet I felt totally at one with the machine, everything fell into place. I was in the zone, I had found the sweet spot, I didn't want to stop riding.... ever. I didn't need to go fast, I had the precision to place the bike into a skid, carve, side slip, stand on the pegs, go through bumps, everything, it all just worked, brilliantly. I didn't need to go fast - it all just worked, brilliantly. Fortunately Carl Day has a spare pair of Alpine SkiBikes foot pegs from his old DaBomb skibike project, he has promised to send them to me here in France. Then I will have 2 dialed in, fully working skibikes that I can trust. I have some people lined up for demo rides already, perhaps next week?